Every year Mr. Nathan and the Sedgwick music program put on a great Christmas concert. Tonight was our ninth and final year of this concert, as all three of our boys cycled through Sedgwick band, one at a time. The highlight of the concert is always the advanced band, which this year is exceptionally good. They played a medley of the Nutcracker which was impressive for a junior high. Calvin plays first chair saxophone, but denies being the best in the school. 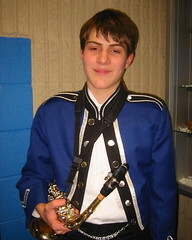 We are crossing our fingers, hoping that our last son will try high school band. Hey, I took two trimesters of high school band.